The all-new 2015-2017 Mustang 3.7L ROUSH V6 Cold Air Kit is the perfect addition to any 2015 V6 Mustang. 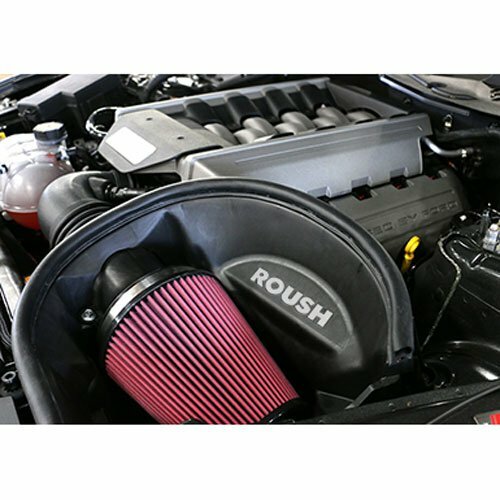 A more efficient air-intake than the stock air filter assembly, ROUSH's cold air kits unlock latent power potential and fuel efficiency that would otherwise be restricted. Custom calibration is not required and a noticeable increase of 10.5 hp and 9 lo-fi of torque is possible. This high flow system has 20% less intake restriction compared to the stock induction system. The kit includes an dry filter that retains its shape during high airflow and is made up of an inner and outer layer of wire mesh that ensures durability and support of the filtration media. You don't' need to use messy oils to maintain this filter, just simply wash it and let it dry. 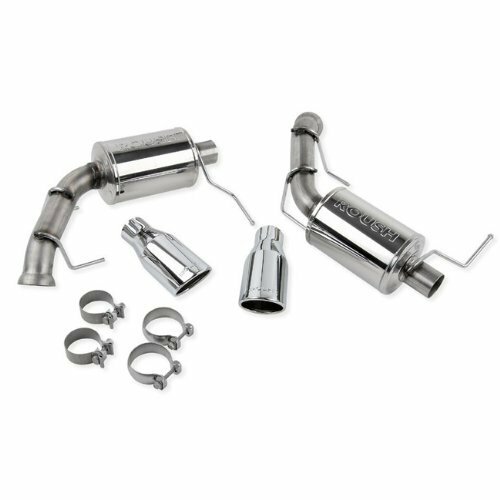 Give your 2015-2019 V6 or EcoBoost Mustang a more aggressive sound and boost performance with a ROUSH exhaust system. 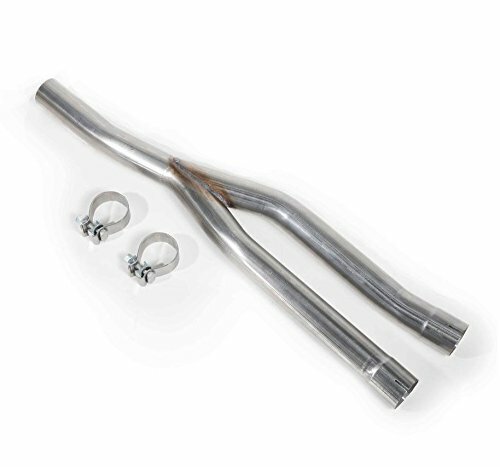 2015-19 ROUSH Axle Back exhaust systems are constructed of corrosion resistant T-304 stainless Steel and are mandrel bent. Mandrel bending maintains a constant inner diameter with no kinks or creases. This improves exhaust flow and reduces backpressure in the system. 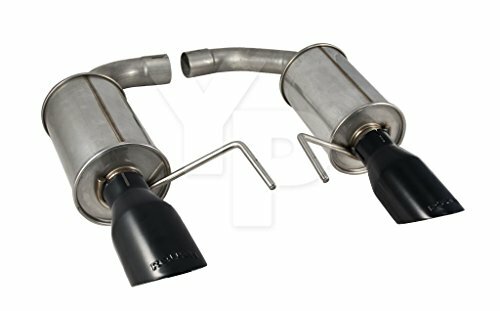 This system includes single tip High flow mufflers that improve the stock sound. 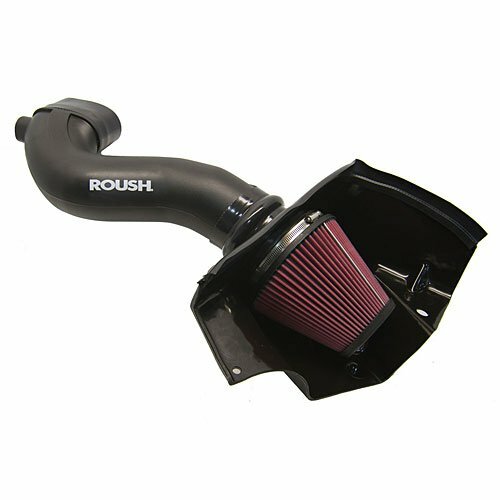 Roush's 420131 air intake & axle back 421127 exhaust for the 2011-2014 Mustang GT. 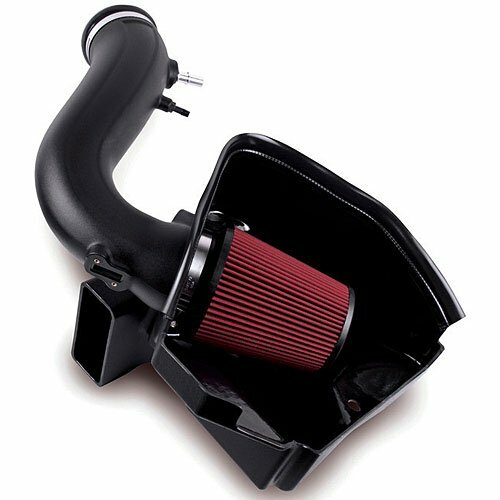 The all-new 2015-2017 Mustang 5.0 Liter ROUSH V8 Cold Air Kit is more efficient air-intake than the standard stock air box. Cold air induction allows for latent potential in power and fuel efficiency that would otherwise be restricted, as well as providing reduced pressure drop. A custom tune is not required as this CAI system was engineered and tested specifically for this application ensuring MAF signal performance matches factory settings. As a straight bolt on, with no tune, it is possible to see gains of 10 horsepower and 8 foot-pounds of torque, a noticeable increase. With this kit you can also remove the MAF insert for a 105mm bore MAF and Custom tune your PCM for even more power. Our dry filter is proven to retain its shape under high airflow and is composed of an inner and outer layer of wire mesh for durability and reliable support of filtration media. The filter requires no oiling and is easily washable for re-use. Included in the kit is the air filter with clamp, injection-molded lower air box/tray with installed EPDM foam hood seal, Blow Molded clean air tubes and all required mounting hardware. The kit utilizes all factory emissions and vacuum lines. Factory mounting locations and hardware are utilized to allow for quick and easy installation. 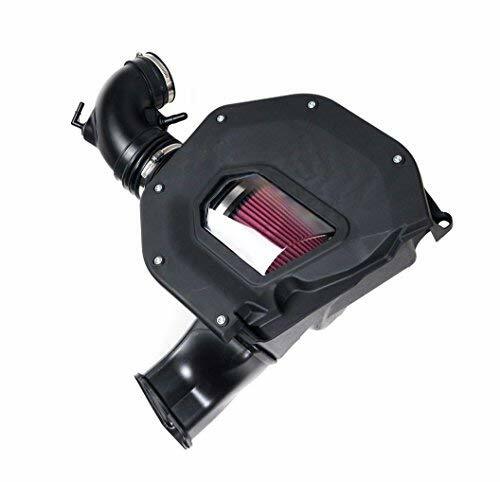 NOT APPROVED FOR SALE IN CALIFORNIA OR STATES THAT REQUIRE CALIFORNIA E.O.# The all-new 2018-2019 Mustang 5.0L ROUSH V8 Cold Air Kit is more efficient air intake than the standard stock airbox. Cold air induction allows for latent potential in power and fuel efficiency that would otherwise be restricted, as well as providing reduced pressure drop. A custom tune is not required as this CAI system was engineered and tested specifically for this application, ensuring MAF signal performance matches factory settings. Included is an innovative airbox lid with see-through lens. Our dry filter is proven to retain its shape under high airflow, and is composed of an inner and outer layer of wire mesh for durability and reliable support of filtration media. The filter requires no oiling and is easily washable for re-use. Included in the kit is the air filter with clamp, injection-molded lower airbox/tray with installed EPDM foam hood seal, blow-molded clean air tubes, and all required mounting hardware. The kit utilizes all factory emissions and vacuum lines. Factory mounting locations and hardware are utilized to allow for quick and easy installation. 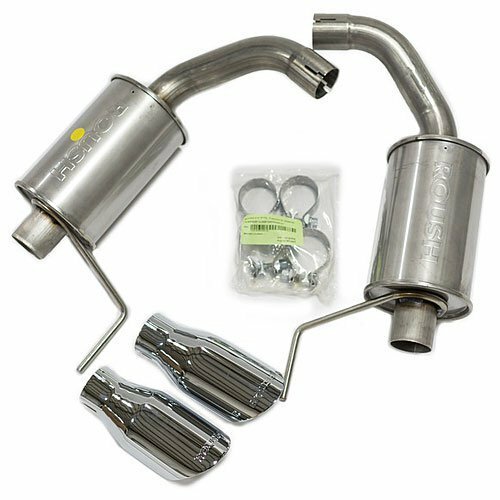 This kit fits 2011-2014 V6 Mustangs and features an all-new ROUSH open-chambered muffler with round tips. In contrast to the conventional fiberglass-packed muffler design, this open muffler has a less inhibited sound, increased longevity (because there is no fiberglass packing that tends to break-down over time), and increased air flow for maximized power. Another great feature of this system is the elimination of the in-cockpit boom, which is common in performance exhaust systems at cruising speeds. 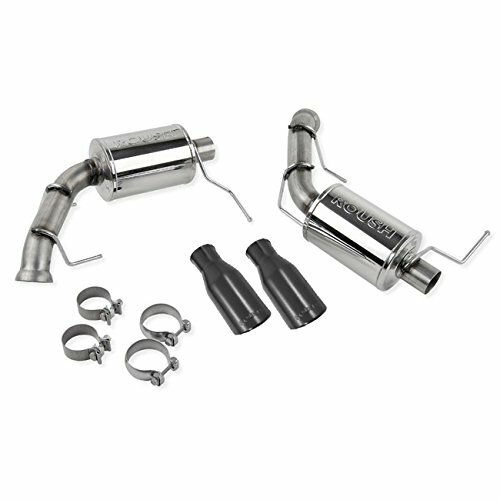 The round tips of this Mustang dual exhaust kit are made from high-quality 304 stainless steel. The shiny finish of these tips are made with a special chrome flashing process that is dramatically more resistant to cracking and flaking than conventional chrome surfacing. 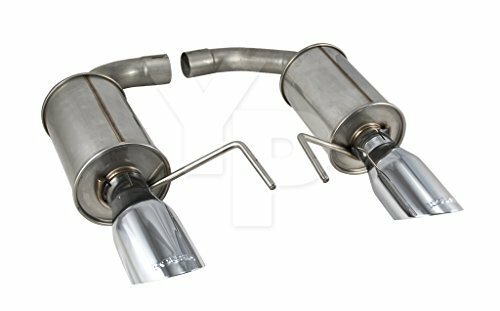 The mufflers and inlet pipe are made from 409 stainless steel for improved durability. This V6 Mustang Exhaust kit installs quick and easy. It uses the factory hanger mounting points -- you don't have to fabricate your own. This kit also features spherical OE-quality clamps for a perfect fit. This 2018-19 ROUSH Performance Axle-Back Exhaust System is constructed of corrosion-resistant T-304 stainless steel, and is mandrel-bent for high-performing airflow. Thanks to hours of research and development, testing, and validation, this system improves flow and reduces back pressure. 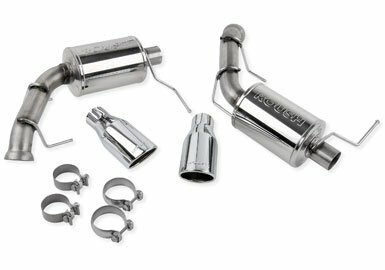 Along with quad polished T-304 stainless steel tips, this system includes dual high-flow mufflers that improve the stock sound, performance, and flow characteristics of the Mustang's V8 powerhouse. Despite being the least expensive engine option in the 2015-2017 Mustang the V6, with 300HP on tap, is still very potent. Shouldn't the exhaust note reflect that? 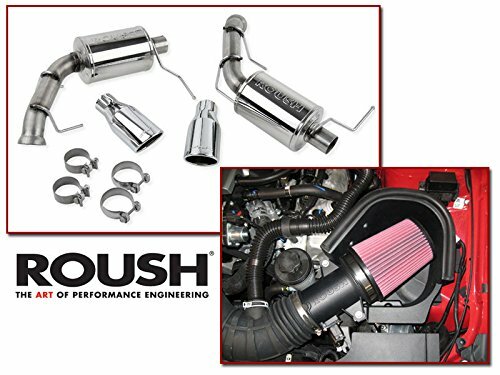 Constructed from T-304 stainless steel, the 2015 ROUSH V6 exhaust is corrosion and stain resistant. Constant diameter mandrel bends maintain high flow and reduce backpressure. This axle back system improves sound and performance with single tip High flow Mufflers. ROUSH Performance's Resonator Delete Y-Pipe is a quick and affordable way to eliminate your factory resonator to get deep, aggressive and race-inspired sound. 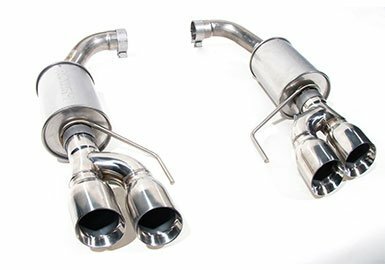 Our Y-Pipe increases flow through your 2015-2019 Mustang I4 exhaust system for maximum horsepower and torque. The 2.5-inch Y-Pipe assembly is made from high-grade mandrel-bent 304 stainless steel to ensure maximum flow with less back pressure and long-lasting durability. The system is designed and engineered using OEM vehicle CAD data to ensure perfect fit. 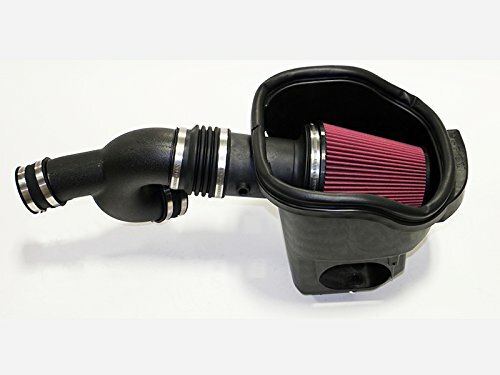 Upgrade your 2005-2009 Ford Mustang GT with this Cold Air Intake Kit and unleash an additional 17 hp and 9 ft-lb of torque out of your engine, while increasing your fuel efficiency. 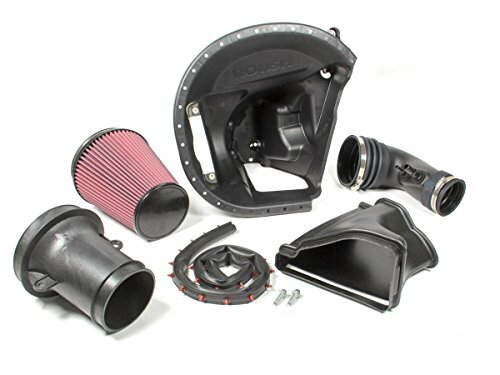 The kit features the ROUSHÂ air filter, air dam, and induction tube. 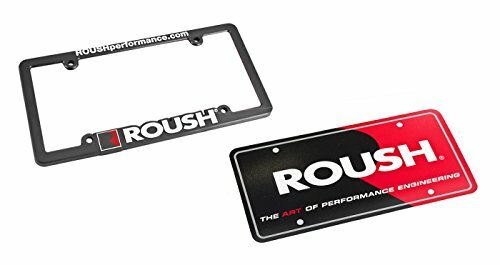 License plate & license frame from ROUSH. Durable, high quality plastic construction. 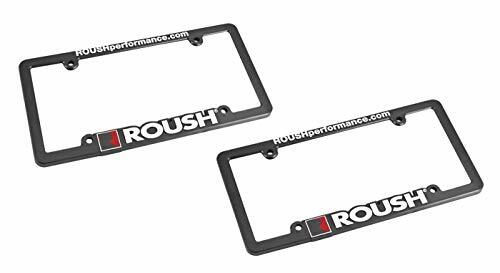 Front and rear license plate frames from ROUSH. 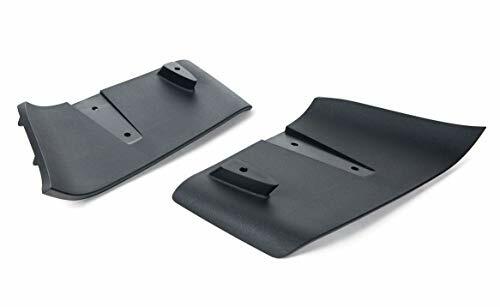 Durable, high quality plastic construction. Compare prices on Roush Mustang Performance at LiveSaler.com – use promo codes and coupons for best offers and deals. We work hard to get you amazing deals and collect all avail hot offers online and represent it in one place for the customers. Now our visitors can leverage benefits of big brands and heavy discounts available for that day and for famous brands. We try to makes comparison shopping easy with Product Reviews, Merchant Ratings, Deal Alerts & Coupons. Find Deals, Compare Prices, Read Reviews & Save Money.